Change in Embassy Imposed Exchange Rate - Gateway to Canada | Canada Immigration Consultancy! 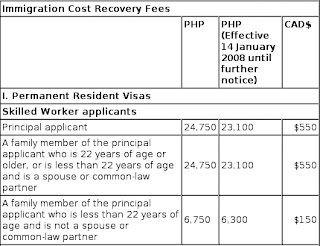 Starting January 14, 2008, the Canadian Embassy Manila will impose a lower exchange rate for its processing fees from P45 to a Canadian dollar down to P 42 a dollar. Thanks to Overseas Filipino Workers' dollar remittances, Philippine peso is getting stronger.